There is a universal premise in retail – if people can’t get to stores, they can’t shop. It’s a very simple concept, yet time and again this principle fails to get considered during the planning process – especially when it comes to retail. Through our work at LOA, we have come across our fair share of projects that left us, let’s just say, confused. There was that 14,000 sf isolated retail in a mixed-use building located about .2 miles from a nearby shopping district. If that distance wasn’t bad enough, the space was located at the bottom of a hill on a street that dead-ended at a highway. Or what about that urban grocery store adjacent to a major expressway? While it was certainly visible, it was not accessible because there was no nearby exit ramp. So every day thousands of cars would see the big sign for the shopping center and drive right by because they couldn’t get there. Let’s just say that the developer of that project skirted bankruptcy. Over twenty years we have witnessed our fair share of “don’ts”. Over time, our experience has led us to the conclusion that planning strategies are often based on an imaginary trade area, rather than a real trade area. Trade area is the area from which a store or district will pull (think “gravity” here) the majority of their customers. We take the question of trade area very seriously because it under girds every single piece of data a market research firm will provide to you about your district. Get this wrong and you might as well throw that report away. At the most simplified level, the ability to predict a district’s gravitation pull – or trade area – is directly related to two characteristics. One is the distance (or accessibility, but I’ll get to that in a minute) of a district to its customer base. The other is the number and total square footage of retail offerings – what can also be referred to as mass. These two principles, mass and distance, are taken from science. In science we know that the greater the mass of an object, the more of a gravitational pull it has on other objects. The same goes for commercial districts. A district with a greater number of offerings (whether it be in the number of businesses or total SF) generally correlate to a larger trade area. I often say that people will travel 1 minute for every 4 minutes of activity. This 1:4 ratio means that if someone travels 30 minutes, they want at least two hours of activity to make the trip worth while. This is simply another way to discuss the relationship between mass and distance. decay between one end of Main Street and the other. Conversely, the shorter the distance between two objects, the greater the gravitational pull and higher interaction between those two objects. More recently we’ve been studying how these ideas relate to “distance decay”. Distance decay refers to the idea that the farther apart you pull two objects, the less interaction you are going to get between those two objects. Here are a few examples of distance decay in practice. The distance between a shopper and a store. The farther a customer has to travel, the less likely they are to patronize a business. We should also keep in mind that “distance” is a loaded term. Lots of things impact how far people perceive a place to be. If going somewhere requires driving around in circles looking for parking, there will be a perception that a distance is greater than if parking is easily available. The distance between two stores. The further apart those two stores are located, the less likelihood a customer will shop at both during a single visit. The distance between a parking lot and stores. If there are things to do and see along the way, this distance feels shorter. Our work often centers around ways in which we can reduce distance decay – whether that distance is real or perceived by the customer. This might include way finding or storefront signage or mid-block crossings to name a few. Robert Gibbs, author of “Principles of Urban Retail Planning and Development” likes to say that people stop walking if there is 50 feet or more of a dead zone. Just 50’ can create significant distance decay such that two businesses will be unlikely to share the same customer. This distance is incredibly short – much shorter than most people realize. As you can imagine, this issue comes up extremely frequently in our work. 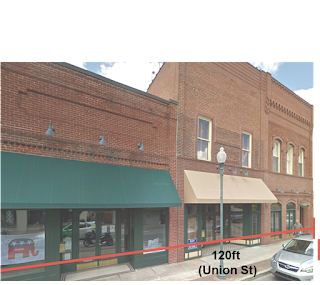 We recently did some work in a community in North Carolina where a rapidly expanding law firm was taking over storefronts along the most vibrant stretch of Main Street – ultimately occupying 120’ linear feet of storefront(!) with office space. This precise issue came up for me many years ago when, as a Project Manager for the NYC Economic Development Corporation during the 125th Street rezoning (2008) we incorporated a restriction that would limit banks to 25 linear feet of store frontage. Since then other communities have followed suit, including Cambridge, MA where we recently completed a retail study. 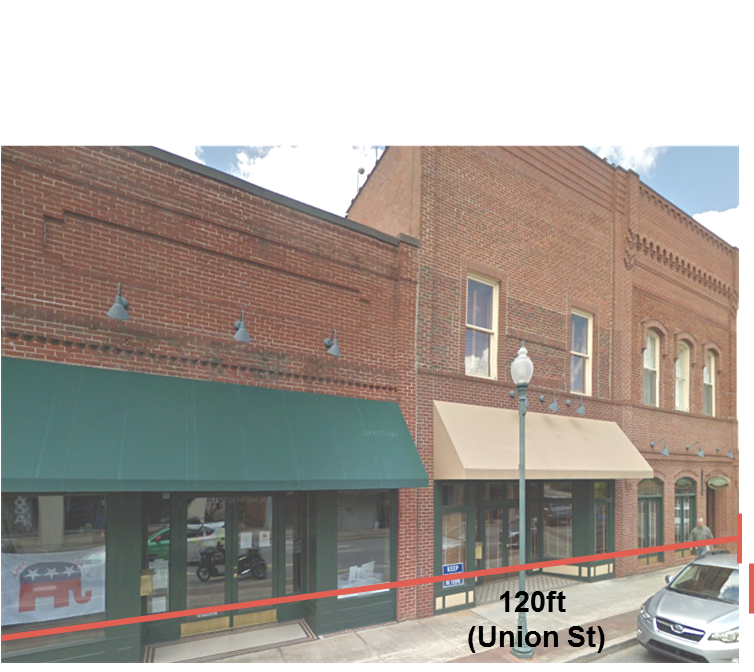 They too limited banks to 25′ linear feet in some commercial districts. So while there are solutions to the very real problem of distance decay, many planners first have to recognize that this is a problem worth addressing.